An extraordinary spectacle is being played out across the land, as newspaper editorial boards are forced by their owners to endorse the Conservative Party. 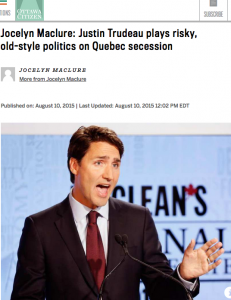 (As Paula Simmons put it, with regard to the Edmonton Journal’s endorsement of Harper: “And yes. Before you ask, this was a decision made by the owners of the paper. As is their traditional prerogative.”) The result has been the most tepid series of endorsements and backhanded compliments I can recall. Here is the Globe and Mail’s, which so far has attracted the most derision. Here is the Ottawa Citizen. The National Post has not released its own yet, but it looks as though they’re having to directly censor Andrew Coyne. So hard to get good help these days! You can make them say what you want, but it’s so hard to get them to sound enthusiastic when saying it. Just when the niqab issue was starting to fade, Stephen Harper brought it up again, with his rather surprising announcement that a Conservative government would consider banning them in the public service (a position that was, not that long ago, ruled out by Tony Clement). So apparently this represents a concerted strategy, of ensuring that the election debate remain focused on the pressing issue of women wearing niqabs. The vast majority of Quebec voters want a change of government in Ottawa. We are a group of academics who believe it’s time for Quebec to fully exercise its political weight in Ottawa, not just in the House of Commons, but also by voting for a party that aspires to form government. I have somewhat mixed feelings about the open letter that was written by my co-bloggers and posted here the other day (which I signed, by the way). There are lots of people out there who dislike Stephen Harper, but who dislike the kind of people who dislike Stephen Harper even more. And I’m sure even now Rex Murphy is penning a diatribe, about how the 587 signatures are a consequence of the tyranny of “political correctness” and “groupthink” in our universities. 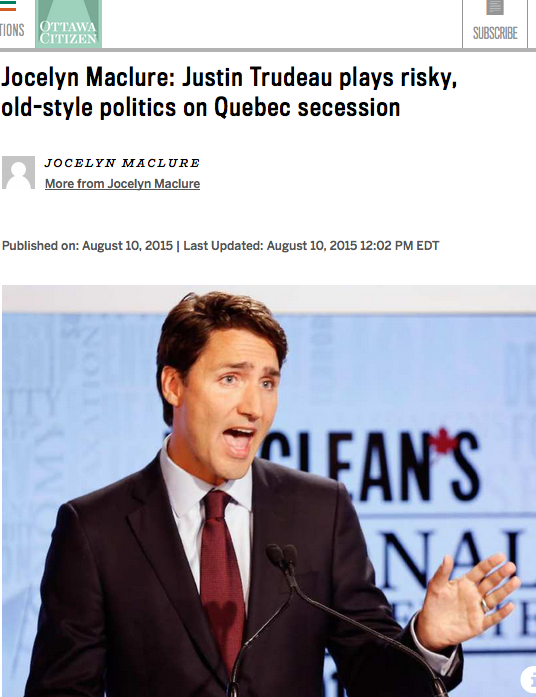 Others will dismiss it as mere partisanship, the ravings of the “Laurentian elites,” etc. Nous sommes un groupe diversifié d’universitaires ayant des vues et des allégeances politiques différentes. Nous sommes unis par l’intérêt commun que nous partageons pour l’intégrité du processus démocratique et par notre inquiétude concernant le virage dangereux et mesquin dont nous avons été témoins plus récemment dans le contexte de la campagne électorale. Dans les politiques électorales démocratiques, il y a une frontière éthique qui distingue les stratégies partisanes fougueuses des tactiques cyniques qui trahissent les valeurs de respect mutuel et de tolérance qui sont au cœur du discours démocratique civique. Les politiciens honorables ne franchissent pas cette ligne même quand ils pensent que cela leur serait politiquement avantageux. Les politiciens sans vergogne ignorent cette limite lorsque cela leur convient de le faire. One of the most important concepts in modern democratic politics is that of “reasonable disagreement.” There are a number of different principles or values that most of us subscribe to, at some level, but in cases where they conflict, it is not entirely obvious how they should be ordered. When should public welfare be assigned priority over personal freedom? How much loss of welfare should be accepted in order to promote greater equality? These are the sorts of questions that define the zone of reasonable disagreement in modern politics. The central distinguishing feature of the right-to-left spectrum of political parties is that they propose different answers to these questions, with the right putting more emphasis on personal freedom, the left more emphasis on equality, and the centre focusing on maximizing welfare. This naturally translates into different views about the role of government in society. People who are dismayed by the current federal Conservative government, and the fact that they stand a good chance of being re-elected this fall, can at least take comfort from one thing. When Canadians finally get tired of Stephen Harper – which inevitably they will – the Conservative party faces the worst succession crisis of any party in recent memory. Indeed, lack of “depth in the bench” has been one of the defining features of this government, one that may help to explain some of its more puzzling features (such as its ineffectiveness on the legislative front).